but, I've been to Las Vegas for a mini-vacation and back again, then life just took over and it's been busy. Enough with the excuses.....I'm back and have a card to share with you. I picked up Mr. Christmoose from Digital Delights, my newest find for digital images. He's cute, but just wait till you see Mr. Jingles the Snowman! Coming soon in a blog entry here.... Each week there is Friday Freebie and you should check out Wendy's blog, Creations by Louby Loo. The papers are from a kit called "Winter Blanket" by Christie Lemmon Designs. 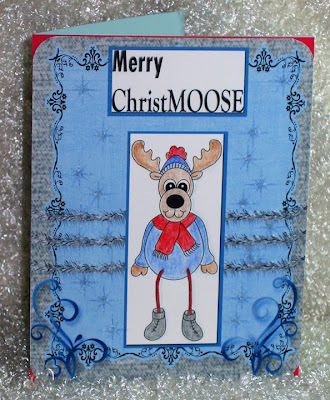 After colouring Mr. Christmoose with Prismacolor Pencils, I mounted it onto a bit of Real Red cardstock with just the corners peaking. I like the way it turned out and it's perfectly flat for easy mailing. Posted by Seniors at Risque at 10:29 a.m.
October 31, 2009 at 3:24 p.m.
OMGosh Barb! He's wonderful!!! LOVE him! October 31, 2009 at 11:58 p.m.